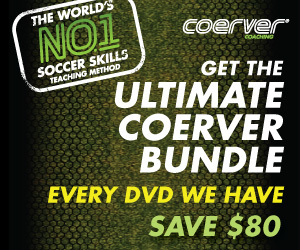 Let's learn how to develop soccer players who play one and two touch soccer, like Xavi and other greats of the game. As a soccer coach, you don’t want your players to become afraid of taking players on or holding on to the ball when doing a drill where you say they can only use one or two touches. Sometimes this is drilled into young soccer player's heads too much, playing with two touches, and they make poor decisions in game situations when they’re thinking they must play two touch soccer. There are times when it's good to hold on to and shield the ball or take a few more touches, you don't want your players to become afraid to do this with strict rules during practice. However, you do want your players to make the game simple and play one and two touch soccer - let the ball do the work. So how do you teach and coach this? Players should have the freedom to play creatively. Don't drill that out of them so to speak with rule driven practices. Try to balance this out and show them when and where it's best to use more than two touches or when it's smart to shield the ball and try to win a foul or get the defender to knock the ball out of bounds. Sometimes you can spin away or turn on a player in one touch, but then other times you need a few more touches on the ball. Players should have the freedom to try different things - especially at a young age. If they do something positive and then take a few more touches, there's obviously nothing wrong with that. Of course, one and two touch soccer is the ideal, as in the tiki taka style of Barcelona. So you want your players to learn the two touch concept, but not lose their creativity or become fearful about making a mistake. 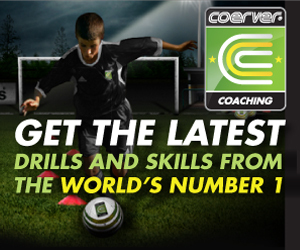 Keep the one and two touch training sessions fun and make a group effort to keep the ball for a record number of times with just one and two touch play. Playing smart soccer is about doing things fast, and two touch soccer accomplishes that, but there are always exceptions. Really, it's about using the space around you and reading the play. It's playing fast mentally, knowing what you want to do with the ball before it comes to you. But again, one thing you don't want your players to develop is the fear of trying new things and taking players on. There is nothing like the ability to take players on. It's a skill that separates the good teams from the great ones. All the great teams have a few players who can turn the game on it's head and change the outcome of the game by a few cuts or dribbles - think Messi, Gareth Bale, or Cristiano Ronaldo. The art of teaching one and two touch soccer is centered in a players fundamentals and how they control the ball. Get your players to play the ball out in front of their feet when they control it. That's the key. Their first touch of the ball. They don't want to control it too close to their bodies or underneath themselves. They should control the ball away from the pressure but a few feet away from themselves so they can make their next move more easily. If the ball is 'out of their feet', it's easier to make the next pass, turn, or cutting movement. It's easier to play two touch soccer. Beyond two touch soccer is of course one touch soccer. Again, it's about stressing the idea to try things, and not make these hard and fast rules. It’s difficult at times but getting your players to play one touch soccer will really get them thinking about where and how they want to play the ball. One touch soccer forces your players to think before they get the ball and anticipate where they have to move to receive the ball. If anything, one and two touch soccer teaches players how to move without the ball and support their teammates. You can't play one touch unless everyone is moving to help one another out and offer support. But before they can do all of this they have to have exquisite touch and control – how do you get that, by spending time with the ball, whether with other teammates or knocking the ball against a wall with both feet. Also, players need to learn how to use their bodies to protect the ball when they receive it so a defender can’t get it – this entails having the ability to play with both feet. More often than not, a player will lose the ball because he or she is trying to play the ball with their favored foot and their body isn’t shielding the ball when they're trying to do this. If you’re dribbling up the left side of the field and there’s a defender on you, then you’ll need to use your left foot to dribble the ball. This way your body is between the defender and the ball. If the defender tries to win the ball it will go out for a throw-in and your team will still have possession. Here's an excellent example of one touch soccer that results in a goal. This is England versus the United States in a friendly in 2008. The first goal is a Terry header off a Beckham cross, but the second goal is a classy goal that's all about keeping the ball moving with quick one and two touch passing. The eleventh pass results in a Steven Gerrard goal. The United States made England look like Brazil in this play. Take a look.